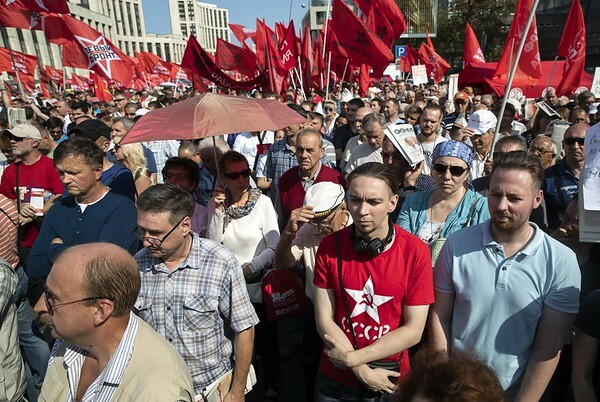 MOSCOW - Russians held rallies throughout the country Sunday to protest a government plan to raise the age for receiving state pensions. The plan has attracted opposition from a notably wide spectrum of age groups and political beliefs. Alexei Navalny, the anti-corruption activist and Putin foe who has built his movement on relatively young and well-educated urbanites, has called for his supporters to rally nationwide next Sunday. People who appeared to be in their 20s and 30s made up a large part of the Communist-called rally in Moscow. Younger opponents of the move fear that keeping older people in the workforce longer will shrink job opportunities for them. Older people complain they may not live long enough to collect significant benefits. Posted in New Britain Herald, Nation-World on Sunday, 2 September 2018 20:46. Updated: Sunday, 2 September 2018 20:49.